In this project we will learn how to make Password Based Door Lock Security System Using Arduino & Keypad. As thefts are increasing day by day security is becoming a major concern nowadays. So a digital code lock can secure your home or locker easily. It will open your door only when the right password is entered. Circuit of this project is very simple which contains Arduino, keypad module, buzzer, Servo Motor and LCD. Arduino controls the complete processes like taking password form keypad module, comparing passwords, driving buzzer, rotating servo motor and sending status to LCD display. Keypad is used for taking password. Buzzer is used for indications. Servo motor is used for opening the gate while rotating and LCD is used for displaying status or messages on it. First of all, we will make the connection to the 4×3 Keypad. For connecting the keypad with the Arduino we are using digital pins D1 to D7. Connect all seven pins of keypad to analog pins D1 ~ D7 of Arduino. To connect the servo motor with the Arduino, use digital pin D9 of Arduino to output PWM pin of servo motor. Now connect the positive wire of buzzer to the pin D10 of Arduino and negative wire to the ground. Now we will connect the 16×2 LCD to the Arduino. 1. Connect pin 1,3,5,16 of LCD to the GND. 2. Connect pin 2,15 of LCD to the VCC (5V). 3. Connect pin 4 of LCD to pin A0 of Arduino. 3. Connect pin 6 of LCD to pin A1 of Arduino. 3. Connect pin 11 of LCD to pin A2 of Arduino. 3. Connect pin 12 of LCD to pin A3 of Arduino. 3. Connect pin 13 of LCD to pin A4 of Arduino. 3. Connect pin 14 of LCD to pin A5 of Arduino. In this project, we have defined default password “4567” in the Arduino. You can change it via coding. When we enter a password, it will match it with the password stored in the Arduino. If it is correct, then it will show ‘Access Granted, Welcome’ and then rotate servo motor to 180 door as door is opened. It will then give 5 seconds time for entering via door. Once 5 second is completed, the door will get locked automatially. If the password is wrong, then it will show ‘Code Incorrect, Go Away’. The buzzer will also beep once when any key is pressed. 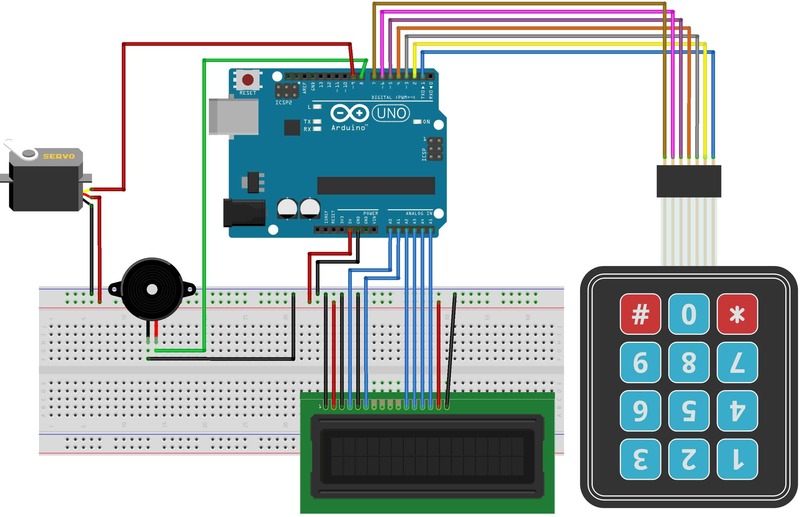 The code for Password Based Door Lock Security System Using Arduino & Keypad is given below. You can simply copy & paste the code using Arduino IDE. The simply compile it then finally upload it to ATmega328 microcontroller. Download the library for Keypad.h from below.